Call it Chennai’s Revolution of Low Expectations. As the city lies battered under multiple onslaughts of rain and mud, it’s people power versus politics that has made the difference. In this metropolis of five million going on to seven million, most often dismissed as the home of Kaapi, Kanjivaram and Kollywood, only one word does justice to the resilience shown by the ordinary citizens of Chennai—heroic. The city has picked itself up on the backs of its least exalted heroes—the common man and woman—and ridden out the storm on the leaky boat of community service. Others may prefer a fibreglass boat as a rescue vehicle; we make do with two empty plastic canisters lashed together with ropes and a plank. Our good samaritan is the tea-vendor, or chai-kadai owner, dispe­nsing hot tea to every pedestrian and poli­ceman at every sreet corner in the midst of the pouring rain. Or the beautifully dressed fishwives, who sit under umbrellas as the skies leak incessantly, selling the day’s catch that their men have risked their lives for by going out to the open sea. Let us not minimise the disaster. The city resembles a flotsam-strewn flood plain. 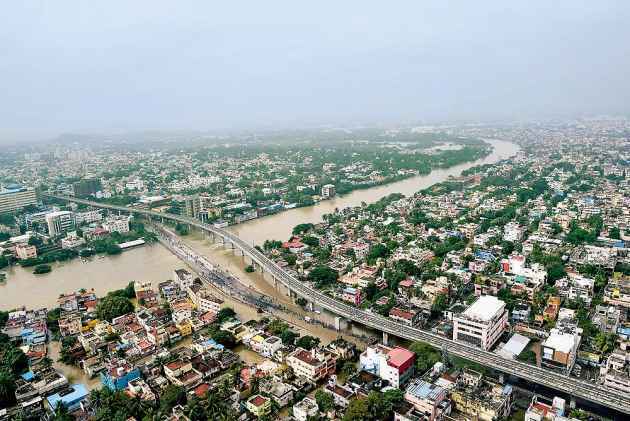 With the release of the waters from the reservoirs at Chembarambakkam and the lakes and catchment areas that had been dry for the most part this year, the Adyar and Cooum Rivers that define the city have become raging torrents. No bridge across these rivers is safe anymore. The flood wat­ers have ripped apart the weak drainage systems, surged through the old wells, rec­laimed the low-lying marshlands, river banks and quarries where debris—both human and industrial—have been dumped. If many places in the city have been left without electricity, it’s because the authorities themselves have turned off the power. Not having power has empowered us Chennai types. Having been relega­ted to a distant realm of a divided Dravidian theocracy where different sects with puzzling acronyms battled it out, Tamil Nadu and its politics looked as murky as a monsoon wedding. It took two weeks for the national media to turn its ele­­ctronic eye on the flood crisis. Until they could beam pictures of ‘foreign visitors’ stranded at the flooded Chennai airport like prisoners at Guantanamo Bay, wearing grungy T-shirts and waving behind rain-washed glass panels, there was no crisis. The lack of grandstanding on the part of politicians and the person on the street actually helped. The floods did not become an occasion for issuing statements of an inf­lammatory kind with the benefit of the video camera. The only time someone took a ‘selfie’, the individual found himself in the river waiting to be rescued. 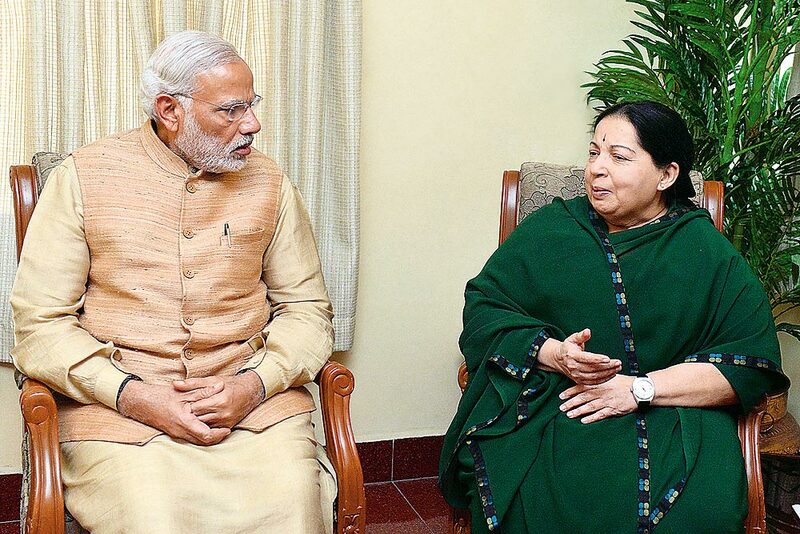 The Tamil Nadu government, whether by design or def­ault, practises management by silence. The Sphinx-like leadership model initiated by M.G. Ramachandran holds an instant appeal to the South Indian mind, trained as it is to recognise their deities by the various symbols—a furry headgear, a coloured shawl, an open book, a cape—and their ini­mitable hand gestures. They don’t ever have to speak. MGR actually perfected an expressive two-digit sign that could be a V for victory or the two-leaf signal of his party. Not expecting the nanny state to provide the leadership means that every person has become a leader. 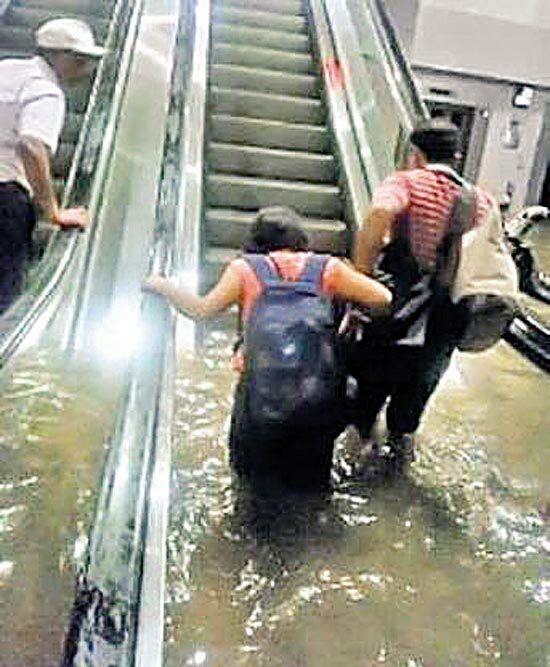 All places of worship inc­luding, of course, theatres and malls, have been opened to shelter stranded people. 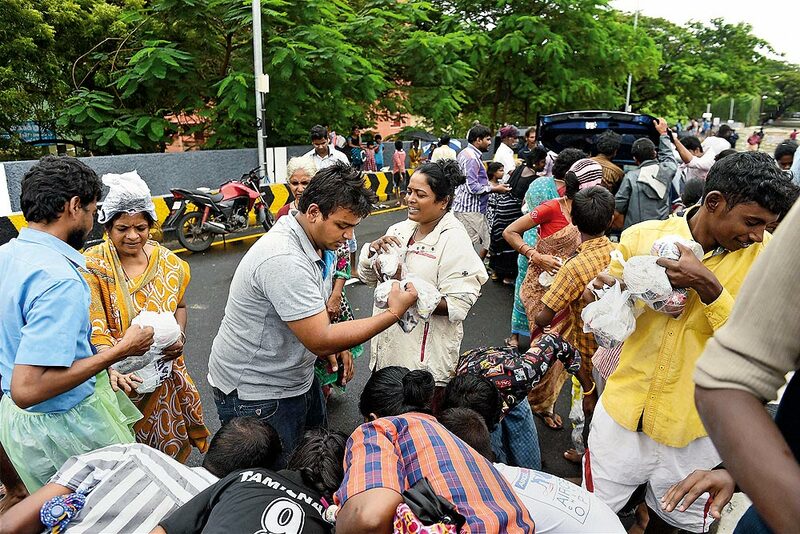 Volunteers have given away and distributed clothes and packets of food—usually, biriyani, Maggi, a loaf or bread or a bun and chapattis. Most crucially, they have offered to recharge cellphones. Drains were cleared by hand. Trees that had fallen were carted away by young men. Women and children were helped to safety on the backs of strangers. Hospitals took in people reg­ardless of whether they could afford them. 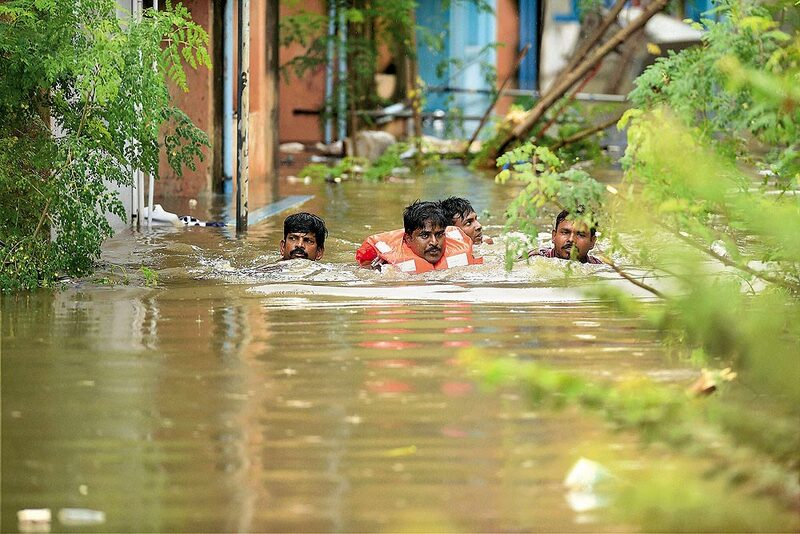 It has been the wettest of times for Chennai, the darkest of times for those who have lost their lives and their homes. 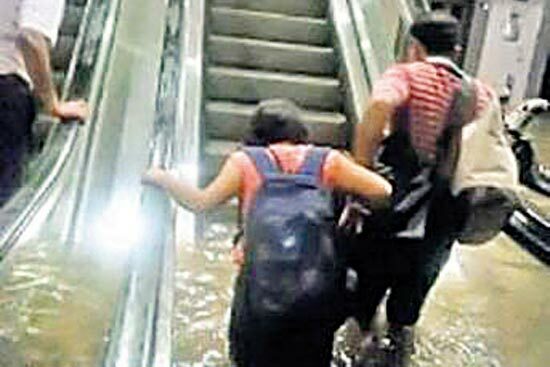 Chennai may be waist-deep in water, but it has shown a remarkable ability to hold out its hand to strangers. Small gestures have added to the image of a city with a great heart. The rain was bad. But wilful contempt for the environment led to the misery. Pallikaranai marshland covered 50 sq km in 2001, now it’s 4.3 sq km. Maduravoyal lake shrunk from 120 to 25 acres. Excess rain had nowhere to drain. Authorities had abandoned retention canals too, further compounding floods. Over 200 Chennai water bodies have been paved over for malls, homes, theatres, offices. Sathyabama University, Phoenix Mall, Chennai airport, Koyambedu bus terminus, knowledge corridor were all built on drained lakes, the Adyar flood plain, drainage canals, or marshland.